I had so much fun experimenting with this recipe and the final result ended up a major home run. So much so, that Zach, who was a self proclaimed mushroom hater, loves these and even requests me to make them for him. That is huge if you knew how much he hated mushrooms! So if you don’t like mushrooms, please don’t write off this recipe. Everyone I’ve made these for raves about them, even mushroom haters. The filling has an array of amazing flavors that I know you are going to love. We usually eat these caps for dinner, but they would also make a fun lunch, side dish or even cut in halves or forths for an appetizer tray. Start by baking the bacon in the oven. I will never cook bacon any other way. I LOVE bacon (who doesn’t?! ), but always hated cooking it. Now I bake it in the oven and it turns out perfect every time and clean up is a breeze. Place your bacon in a single layer on a raised edge baking pan. Do not preheat your oven (important). Put your bacon in the cold oven and turn your oven to 375 degrees. Set a timer for 16 -20 minutes. It’s done! If you like your bacon crispier, you may need to leave it in there for a little longer. Times will vary depending on the thickness of your bacon. Make sure to keep checking it towards the end of the cooking time so it doesn’t burn. While your bacon is baking in the oven, fry your sausage in a skillet until cooked through. Remove from skillet, crumble or cut into pieces and toss in large bowl. Once the bacon is done, put the bacon fat in the skillet. Crumble the bacon and add to the sausage bowl. Over medium heat, cook your onion, pepper, garlic and salt and pepper in the skillet with the bacon fat until onion and pepper are soft – about 3 to 5 minutes. Add in the fresh or frozen spinach and cook until the spinach wilts. Remove from heat and stir in salt, pepper, smoked paprika and Parmesan/Romano if you are using it. Place the mixture in the bowl with the sausage and bacon. Clean out the skillet and pour the olive oil into the skillet over medium heat. Place mushroom caps (I could only fit 2 in my pan so I had to cook the caps in batches) in the skillet and cook for 4 minutes. Flip and cook the other side for 4 minutes. Remove from heat and the balsamic vinegar over top of the caps. Flip the caps over and swirl caps in the pan making sure to get both sides coated with the balsamic. Fill the caps with equal amounts of the sausage spinach mixture. You can add cheese on top and broil until cheese is melted or top with additional Parmesan cheese and parsley. Enjoy! I am trying these this week! I made these for my boyfriend last night and he loved them. 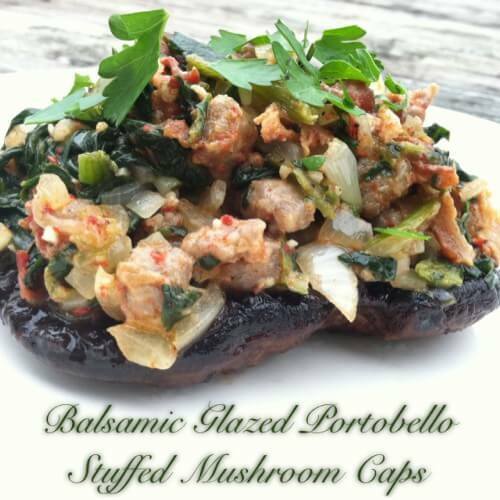 We both like mushrooms, but the stuffing put these over the top. We couldn’t get over how good all the flavors mixed together! I just made these for dinner tonight. It was a little time consuming but completely worth it. They were amazing! Wonderful recipe. We loved these and will make these again. Very, very good recipe! We enjoyed these so much. Ate them for dinner and then made them for lunch again the next day! These were the best stuffed mushrooms I’ve ever had , so flavorful. Everyone I’ve made these for has asked for the recipe. Thanks! I am going to try this on baby bellas and serve it for the super bowl. I think i can totally score with this. I am trying to change our family’s eating habits and this is sure to hit the spot! I’ve read this sort of thing on another site, but you did it better!